John B. Garrett began his military career April 28, 1943, as a Private and served as a combat infantryman in Co. B, 405th Infantry, 102nd Infantry Division during World War II. After 18 months of combat service in the European Theater of Operations, he was separated from the Army in the grade of First Sergeant on March 28, 1946, and remained in the Enlisted Reserve Corps until May 18, 1948, when he was commissioned a Second Lieutenant in Headquarters and Headquarters Company, 36th Division, Texas National Guard. Garrett served in the 36th Division as an infantry unit commander, air operations officer, operations and training officer, and intelligence officer until January 15, 1968. Following the inactivation of the 36th Division, he served as assistant chief of staff, G-2, and assistant chief of staff, G-3, of the Star Emergency Operations Center and as commander of the 144th Support Center, RAO. Upon reorganization of the 49th Armored Division on March 1, 1973, he assumed command of the 49th Armored Division Support Command. During the period Nov. 1, 1975 to April 1, 1976, Garrett served as the commander of the division's 3rd Brigade. On April 16, 1976, Garrett was promoted to Brigadier General with assignment as assistant division commander, 49th Armored Division. On Feb. 8, 1979, Garrett was assigned as base units commander, Texas Army National Guard, and was promoted to Major General. 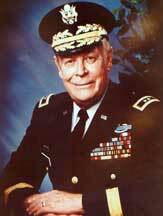 He assumed command of the 49th Armored Division on Nov. 1, 1979, and retired from military service Jan. 16, 1985, with more than 41 years of service. John B. Garrett has the distinction of having held every rank from Private to Major General, with the exception of Technical Sergeant – he was double-promoted from Staff Sergeant to First Sergeant during the occupation years in Germany. Garrett's numerous awards and decorations include the Distinguished Service Medal, the Soldier's Medal, the Bronze Star Medal, the Meritorious Service Medal, the Presidential Unit Citation, and the Combat Infantryman's Badge. Since his retirement, he has continued to give generously of his time, talents, and resources in support of the military forces of our state and nation.